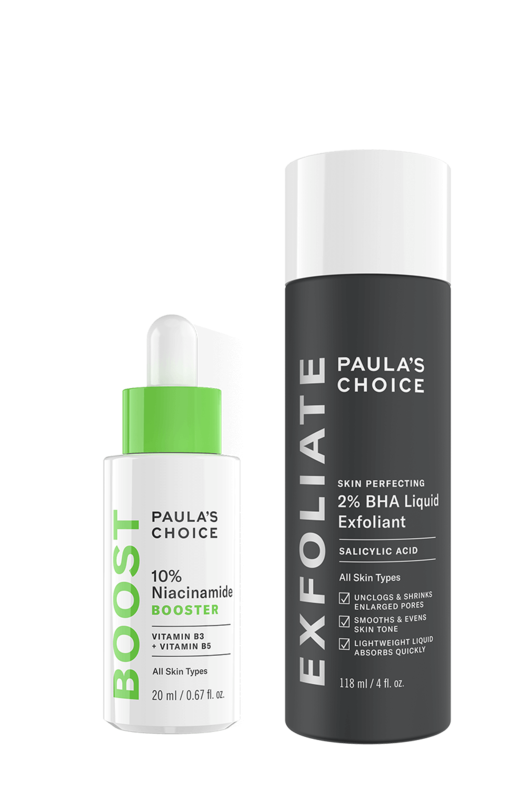 Tackle blackheads, breakouts and enlarged pores with this multi-tasking duo. Quickly absorbed, the Skin Perfecting 2% BHA Liquid Exfoliant quickly removes dead skin cells both on the skin’s surface and inside the pores, reducing blackheads and blemishes. The 10% Niacinamide Booster visibly refines pores, returning them to their natural shape, and helps to fade redness from blemishes..
Lightly soak a cotton pad with Skin Perfecting 2% BHA Liquid Exfoliant and apply over the entire face, including the eye area (avoid the lower lash line and eyelids). Do not rinse. Dispense 2-3 drops of 10% Niacinamide Booster and add to your favourite serum or night moisturiser or use alone. For daytime, follow with a moisturiser that contains a broad-spectrum sunscreen rated SPF 30 or greater. If you're new to exfoliants, we recommend you gradually build up usage from once a fortnight to once or twice a day. It may take some trial and error to find the best frequency for your skin. If you're new to exfoliants, it's best to build up usage to avoid skin irritation. We recommend starting once a fortnight, building up to 1 to 2 times per day. It may take some trial and error to find the best frequency for your skin. During the day, always use a moisturiser with a broad-spectrum sunscreen rated SPF 30 or greater, as your skin is slightly more sensitive to sunlight when using an exfoliant, so the chance of sunburn and sun damage is slightly higher. Allergic to aspirin (acetylsalicylate)? 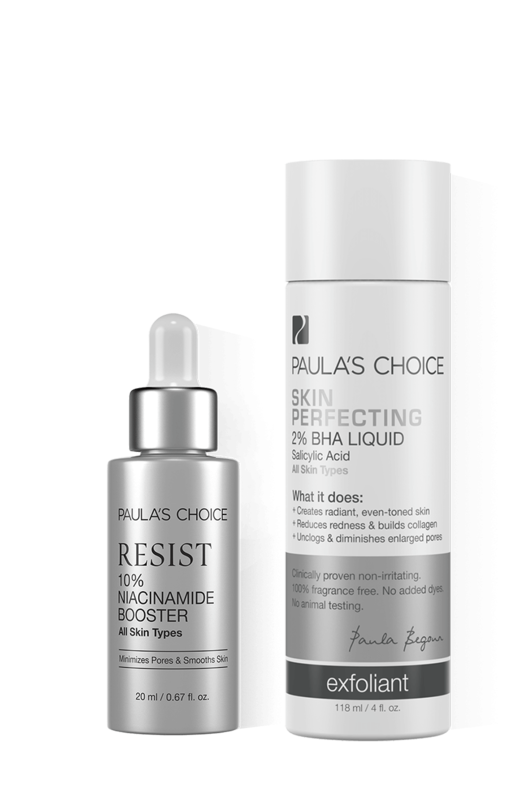 Do not use Skin Perfecting 2% BHA Liquid Exfoliant as it contains salicylic acid (BHA). Skin Perfecting 2% BHA Liquid Exfoliant feels a bit sticky/greasy on my face. Why is that? If the BHA is feeling sticky, you are probably using too much product. The average amount needed is the size of a small coin, and it’s best to apply it in a thin layer. The ‘greasy’ feel can be attributed to the high levels of glycol in this product (glycol helps the BHA penetrate the surface layers of skin and also works as a water-binding agent). If you use too much product or live in a humid, moist climate, this effect will be more pronounced. You can use 10% Niacinamide Booster around the eyes, either on its own or mixed in with 2 or 3 drops of your favourite eye cream, serum or night cream.